ABSTRACT: Over the last decade, the public has become increasingly aware of the potentially dangerous, systemic side effects of pain medication. Even readily available over-the-counter drugs like acetaminophen, ibuprofen, and aspirin can cause serious damage to the digestive system as a result of long term usage and/or high dosage. A possible alternative to pills for pain relief is transdermal drug delivery, the transfer of drugs across the skin. 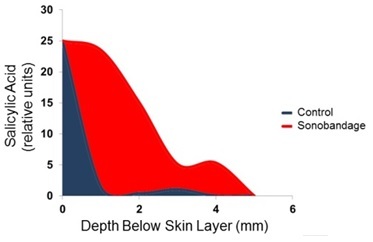 Transdermal delivery has the advantage of keeping the drug in the area where it is applied, allowing for a reduced total dose compared to a pill, but there are challenges with the method. The skin evolved as a highly efficient barrier to keep foreign substances out. After a drug gets through the skin, there is the problem of assuring drug is delivered evenly in a dose that is effective. Current transdermal drug delivery methods such as aspirin creams use chemical enhancers to allow the drugs to pass through the skin. The amount of aspirin that is absorbed by the body is still limited however and may not provide adequate pain relief. Faced with these challenges, there is a great deal of interest in researching new drug delivery methods for pain relief which are administered locally and may not have the same systemic side effects as oral medications. INTRODUCTION: Nowadays about 74% of drugs are taken orally and are found not to be as valuable as most wanted. To advance such characters transdermal drug delivery system was emerged. The first transdermal drug delivery (TDD) system, transderm-Scop developed in 1980, contained the drug scopolamine for treatment of motion sickness. The transdermal device is a membrane-moderated system. The membrane in this system is a micro-porous polypropylene film. The drug reservoir is a solution of the drug in a mixture of mineral oil and polyisobutylene. This study release is maintained over a three-day period. The World Health Organization (WHO) estimates that low- and middle income countries are disproportionately affected. 82% of CVD deaths take place in low and middle-income countries and occur almost equally in men and women. In order to deliver therapeutic agents through the human skin for systemic effects of the cardiovascular / antihypertensive diseases, the comprehensive morphological, biophysical and physicochemical properties of the skin are to be considered 1, 2, 3, 4. Sonobandage: Sonobandage technology developed by the US Company ZetrOZ. The sonobandage is a high efficiency ultrasound generation system with closely coupled electronics, transducer and lithium-polymer rechargeable battery. Sonobandage systems were designed to operate from 100 kHz to 3MHz, and work in conjunction with a disposable ultrasound coupling and drug-loaded hydrogel 5. The ultra sound device is a lead-zirconate-titanate (PZT-8), silver-plated piezocrystal composite. The back is an electronic circuit housed in an epoxy-resin wire connected to either a lithium-polymer battery or a 2-10 V power supply that regulates ultrasound output intensity. Main thing is adhesive bandage that is made up of cotton of plain weaved. It gives support medication and other things on the object. And it has semipermiable membrane in the center for diffusion of drug 6. 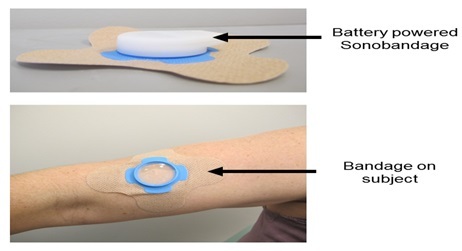 The Sonobandage uses a novel type of ultrasound gel that can be loaded with medication. 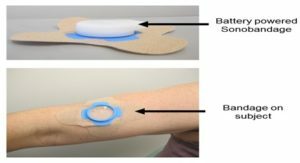 The miniature ultrasound device (about the size of an iPod nano) clips into the sonobandage and produces continuous oscillating sound pressure waves that deliver the medication through the skin over multiple hours 7. Using the sonobandage system enhanced the ability of salicylic acid, the active form of aspirin, to cross over a bio-mimic skin model by 2400% Fig. 2. Another positive aspect of the ultrasound sono-bandage system is that it promoted an even distribution of medication over the entire treatment volume 8. Experiment which shows Diffusion of Salicylic Acid through the PEO Hydrogel (Mass Transport Experiment): The hydrogel disks that had been stacked as the tissue analog were separated carefully using a tweezers. The tweezers was rinsed to prevent transfer. Each disk was immersed in 25 ml 0.1% iron (III) chloride for a period of 90 sec The Fe3+ ion reacted with phenols to create a brightly colored violet complex. Developed disk stacks showed areas of deep purple, where salicylic acid had penetrated. These stacks were imaged. The area and intensity of the purple color was quantified using Image. To control for variability in pictures or camera position, each experiment was normalized. The intensity of the purple color in each disk was divided by the intensity in the source disk, creating a relative intensity scale from 0 to 1. Additionally, the area stained purple on each disk was measured, and the overall disk area, 8 cm2, was used to convert from a pixel area to a stained area. Additionally, the volume stained could be estimated by multiplying the area stained on each disk by 2 mm, the thickness of the disks. To estimate the total amount of salicylic acid that had transfered into each disk, the area (cm2) which was stained was multiplied by the relative intensity of the stain. The total salicylic acid delivery into the tissue analog was the sum of the salicylic acid over all of the disks 9, 10. In sonobandage, NSAID (non steroidal anti-inflamatory drug) is used so no side effect and give quick pain relief. Oral madication may give side effect and damage the digestive system but sonobandage no side effect and do not damage the digestive system. It gives action in less time respect to oral medication 11. It increases the permeability of stratum cornium skin layer and diffuses the drug by transdermal pores. Transdermal drug delivery by sonobandage to improve the quality of care provided to patients with PN (Peripheral Neuropathy). It gives the quick pain relief on a subject by transdermal drug delivery. It also used blood-brain disruption and delivery of therapeutic molecules into the brain 11. CONCLUSION: Transdermal drug delivery systems represent a beneficial innovation for drug delivery, particularly in patients who cannot swallow or remember to take their medications. Topical administration of therapeutic agents offers many advantages over conventional oral and invasive methods of drug delivery. Salicylic acid delivery through a skin and soft tissue analog was measured with and without ultrasound exposure. Both low and high frequency ultrasound enhanced transport of salicylic acid through the membrane. So ultrasound waves increases the transmission of salicylic acid through the skin. ACKNOWLEDGEMENT: The authors thankful with our deepest core of heart to Mr. Rohit Kumar Bijauliya, for his valuable guidance. Ahmed A, Karki N, Charde R, Charde M and Ganghare B: Transdermal drug delivery system an overview. Int J Biomed Adv Res 2011; 2: 38-56. 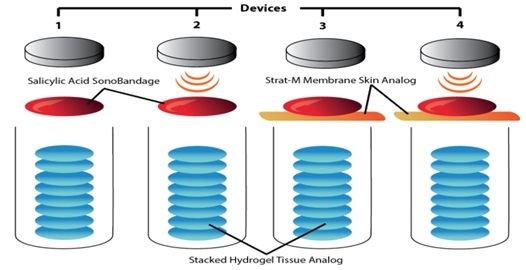 Patel A, Visht S and Sharma PK: Transdermal drug delivery system: Next generation patches. J Drug Discov Dev 1: 43-65. 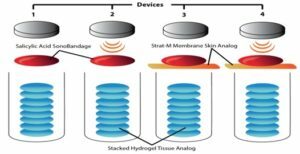 Sonkar R, Prajapati SK, Chanchal DK, Bijauliya RK and Kumar S: A review on transdermal patches as a novel drug delivery system. Int J Life Sci & Rev 2018; 4(4): 1-11. doi: 13040/IJPSR.0975-8232.IJLSR.4(4).1-11. Vyas SP and Khar RK: Controlled drug delivery: Concepts and advances, Vallabh Prakashan, Edition 1st, 2002: 411-445. Bacchi S, Palumbo P, Sponta A, and Coppolino MF: Clinical pharmacology of non-steroidal anti-inflammatory drugs: a review. Anti-inflammatory and Anti-Allergy Agents in Medicinal Chemistry2 012; 11: 52-64. Polat, BE, Hart D, Langer R and Blankschtein D: Ultrasound-mediated transdermal drug delivery: Mechanisms, scope, and emerging trends. Journal of Controlled Release 2011; 152: 330-348. Yuan Y, Chen XY, Li SM, Wei XY, Yao HM and Zhong DF: Pharmacokinetic studies of meloxicam following oral and transdermal administration in Beagle dogs. Acta Pharmacol Sin 2009; 30: 1060-1064. American Geriatrics Society Panel on the Pharmacological management of persistent pain in older P. Pharma-cological management of persistent pain in older persons. Journal of the American Geriatrics Society 2009; 57: 1331-1346. Backonja MM: Use of anticonvulsants for treatment of neuropathic pain. Neurology 2002; 59: S14-S17. Bommannan D, Okuyama H, Stauffer P and Guy RH: Sonophoresis I the use of High-Frequency Ultrasound to enhance. Transdermal drug delivery. Pharmaceutical Research 1992; 9: 559-564. Coussios CC, Farny CH, TerHaar G and Roy RA: Role of acoustic cavitation in the delivery and monitoring of cancer treatment by High-Intensity Focused Ultrasound (HIFU). International Journal of Hyperthermia 2007; 23: 105-120. Kant P, Navani NK, Bijauliya RK and Chanchal DK: Transdermal drug delivery by sonobandage: A mini review. Int J Life Sci & Rev 2018; 4(9): 172-75. doi: 10.13040/IJPSR.0975-8232.IJLSR.4(9).172-75.